How It Works: Several scientific studies show that consumption of omega-3 essential fatty acids (EFAs) can benefit good health. Flax Seed Oil is a rich source of EFAs, including linoleic acid. Fatty acids are termed “essential” because the body cannot manufacture them. 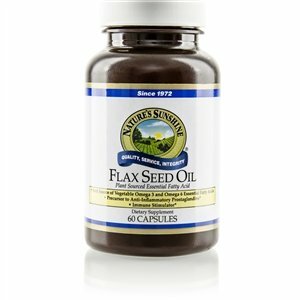 Flax seed oil is a convenient pant-source alternative to fish oils. The body produces prostaglandins— precursors to hormones and other compounds. Some of these initiate beneficial reactions while others produce negative effects. An improper balance of EFAs in the diet can lead to increased production of the “bad” prostaglandins. Flax Seed Oil with Lignans provides the ideal ratio of omega-3, omega-6 and omega-9 EFAs required to maintain the necessary balance between good and bad prostaglandins. Lignans are phytoestrogens that provide powerful benefits, including boosting the immune system and maintaining hormone balance.